The Molded Fiberglass Armchair (Brass) by Inmod is a unique twist on an old classic. A brass finished steel base perfectly compliments the fiberglass seat in your choice of color and finish. Stocked in classics or special ordered for a unique combination, this affordable iconic classic will always be in style. The Molded Fiberglass Arm Chair has become an iconic 20th century design. Originally called the Molded Fiberglass Wire-Base Armchair, it was the result of much experimentation with molded forms. Inmod's reproduction, called the Molded Fiberglass Arm Chair is a highly accurate reproduction staying true to the specifications of the original. Inmod has been careful to preserve all of the details that make this a timeless piece that is customizable to match your decor. Inmod's exclusive, newly introduced brass finish adds a new dimension of versatility and vision to an already timeless classic. Style was a no brainer for me as I love iconic design especially with something original like the brass base thrown into the mix. Just want to mention seat is deeper than it looks which makes it ultra comfortable! It was a nice surprise! Love that I found this design in brass, apparently this is the site to go to for best mid century modern reproductions - agreed!! great look for design overhaul! I recently did a design overhaul in my kitchen and dining room and these are a strong part of the new look along with the table I ordered from Inmod as well! Thanks for selling such great reproductions and unique items I haven't really seen anywhere else! YES!! 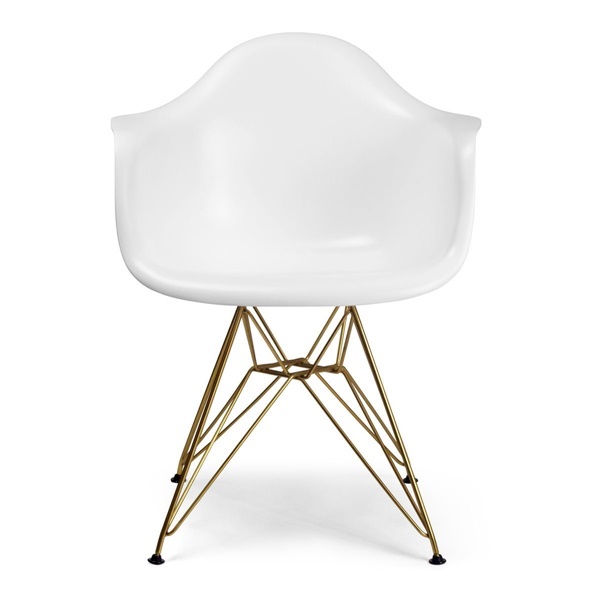 For this iconic style with a brass base the price was so ridiculously affordable! They are outstanding! 5 Stars! They FINALLY arrived! Thrilled with them - took longer than expected so we've been eating in our living room for the last month but it's all good just happy they are here! Brass base matches nicely with the brass decor in my living room, perfection! wow!! white fiberglass and brass base is an incredible combo! Compliments have been pouring in since i've ordered them! I wanted something a little different but was drawn to this design. I was so happy I found this chair with brass legs and a white seat. The contrast is subtle but lovely. This chair is well-made and supportive! This was the dining room revamp I was looking for. I love my dining table but wanted a new style, I switched out the old chairs with these and voila! just like that it was like a whole new space. I love the way they look! Thank you! I've always loved the design of these and was very happy when I found not only Inmod but with a brass base! How cool are these?! I've never seen them with a brass base before but they compliment my kitchen so well. I'm thrilled. how high is the arm? The Arm Height of the Molded Fiberglass Armchair (Brass) is 30 inches.